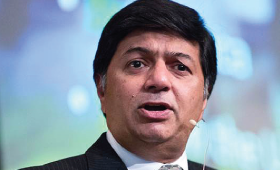 A founding member of the Conscious Capitalism movement, Raj Sisodia is FW Olin Distinguished Professor of Global Business and Whole Foods Market Research Scholar in Conscious Capitalism at Babson College. He is also co-founder and co-Chairman of Conscious Capitalism Inc.
Raj has published seven books and over 100 academic articles. His work has been featured in the Wall Street Journal, The New York Times, Fortune, Financial Times, The Washington Post, The Boston Globe, CNBC, etc. His book Conscious Capitalism: Liberating the Heroic Spirit of Business (with John P. Mackey, co-founder and co-CEO of Whole Foods Market) was published by Harvard Business Review Press in 2013, and rose to #2 on the Wall Street Journal Business Bestseller list. Earlier books include Firms of Endearment: How World Class Companies Profit from Passion and Purpose (named one of the best business books of 2007 by Amazon.com) and The Rule of Three: How Competition Shapes Markets (a finalist for the 2004 Best Marketing Book Award from the American Marketing Association). Other books include The 4A’s of Marketing: Creating Value for Customers, Companies and Society (with Jagdish N. Sheth, Routledge, 2011), Tectonic Shift: The Geoeconomic Realignment of Globalizing Markets (with Jagdish N. Sheth, Sage Publications, 2006) and Does Marketing Need Reform? (co-edited with Jagdish N. Sheth, M.E. Sharpe, 2006). In 2003, Raj was cited as one of the “50 Leading Marketing Thinkers” and named to the “Guru Gallery” by the Chartered Institute of Marketing. Bentley University honored him with the Award for Excellence in Scholarship in 2007 and the Innovation in Teaching Award in 2008. He was named one of the “Ten Outstanding Trailblazers of 2010” by Good Business International, and one of the “Top 100 Thought Leaders in Trustworthy Business Behavior” by Trust Across America for 2010 and 2011. A frequent and popular keynote speaker, Raj has made nearly 500 presentations at leading universities, corporations, non-profits and other organizations around the world. Raj was born in India in 1958 and is married with three children. He was educated as an electrical engineer from the Birla Institute of Technology and Science (BITS, Pilani). He pursued an MBA in Marketing from the Jamnalal Bajaj Institute of Management Studies in Mumbai after which he earned a Ph.D. in Marketing and Business Policy from Columbia University. Until 1998, he was Director of Executive Programs and Associate Professor of Marketing at George Mason University in Fairfax, Virginia. From 1985 to 1988, he was Assistant Professor of Marketing at Boston University. He is an American citizen residing in Lexington, Massachusetts.